Your entry subscription will be $15, with $5 going to Australian Rotary Health (ARH) and $10 to the prize pool. Click HERE and read all about it. Click on the “FAQ” tab to learn about the process. Members who do not have access to the website can send their tips to the Competition Manager (Bob Sedunary),who will enter them for you. Tips are required 24hrs before the “Cut-off” time if you choose this option. 0 points for tipping a losing team. You receive 5 bonus points if you tip a perfect round. If you are un-financial or join later than beginning of Round 1, you will be allocated points as if you selected all “Away” teams. The RCEB Competition will only be conducted on the Minor Round matches. You will be asked to nominate the "Margin" in points of the first match listed in each round. We will also have a “Joker” round which you nominate to double your points for that round. (Conditions apply). 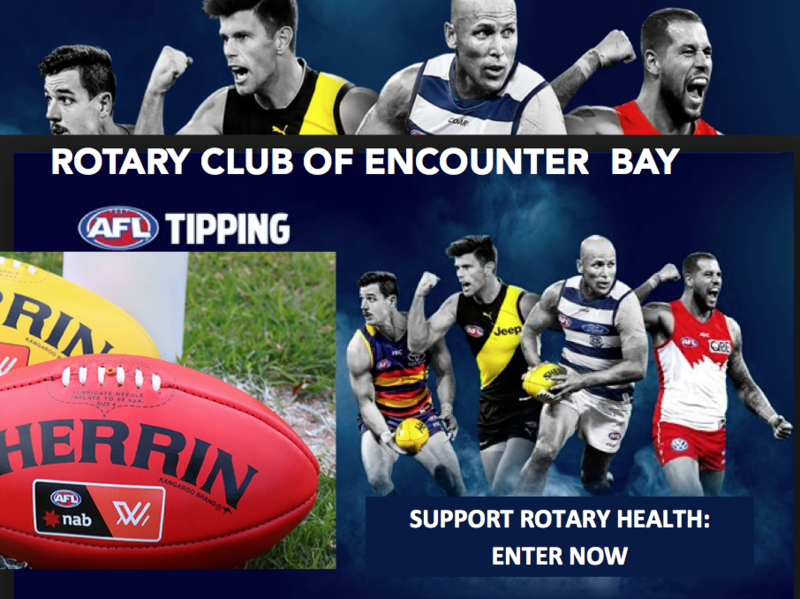 The RCEB will also operate a “Knockout Comp” in conjunction with the “Tipping Comp”, at no additional cost. Please read up on details. The prize for the winner of the “Knockout Comp” will be “Bragging Rights” for remainder of season. Members will be classed as “Financial” when Bob Sedunary has received their membership fee prior to the “Cut-off” time for the next Round. Each Minor round winner: 2% of current prize pool. 1st (At end of Minor rounds) 25% of prize pool. 2nd (At end of Minor rounds) 15% of prize pool. 3rd (At end of Minor rounds) 10% of prize pool. Last (At end of Minor rounds) 4% of prize pool. Once registered you can join the Encounter Bay competition. Start by logging in (top right). Comp Password is: Enc0unter19 – Yes the o is a zero. Go to the tipping website each week to add your tips.